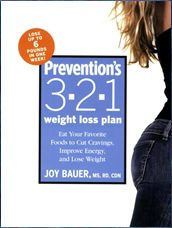 Prevention’s 3-2-1 Weight Loss Plan: Eat Your Favorite Foods to Cut Cravings, Improve Energy, and Lose Weight is written by the New York Times best-selling author, Joy Bauer. In this program Bauer shows how you can boost energy, reduce cravings, and lose weight while still eating your favorite foods. Bauer says that by following this program you can lose up to six pounds in the first week and two pounds every week thereafter. Dieters are introduced to the 3-2-1 Eating style where you boost your energy and reduce food cravings by eating 3 meals, 2 snacks and 1 optional treat each day. You will aim for a calorie intake of 1200, 1500 or 1800 calories a day depending on a variety of factors such as age, gender and how much weight you want to lose. There are 3 phases to this energy boosting diet program. Phase 1 involves a reduction in the intake of carbohydrates and restricts foods such as bread, pasta, potatoes and rice. This phase lasts for one week. Phase 2 is then followed until you reach your target weight and Phase 3 is the maintenance phase. In addition to 3-2-1 Eating you will also follow a pattern of 3-2-1 Thinking involving positive behaviors. Certain behaviors are undertaken 3 times a day – for example drinking herb tea after each meal – 2 times a day (before lunch and dinner) and 1 time a day (at the end of the day). Fruit, vegetables, whole grain bread, high fiber cereal, raisins, sunflower seeds, nuts, wheatgerm, cottage cheese, low-fat yogurt, eggs, chicken breasts, turkey bacon, roast beef, smoked salmon, scallops, shrimp, tuna, chickpeas, black beans, endamame, mustard, low-fat mayo, low-fat salad dressing, dark chocolate, iced tea, red wine. The 3-2-1 Fitness system is designed to burn fat and boost energy, while helping you to stay motivated. You will perform fitness circuits consisting of 3 minutes of cardio, 2 minutes of strength exercises and 1 minute of abdominal exercises, which is repeated, for a total of about 30 minutes each day. Prevention’s 3-2-1 Weight Loss Plan: Eat Your Favorite Foods to Cut Cravings, Improve Energy, and Lose Weight retails at $18.95. Dieters can eat their favorite foods each day to reduce cravings. Exercise program is short and motivating. Includes energy boosting menu plans, recipes and a shopping list. The first week of the program is fairly restrictive. Will involve extra time to be spent in meal planning and preparation. May be difficult to eat out and stick with the program. Prevention’s 3-2-1 Weight Loss Plan is a simple weight loss plan that focuses on boosting energy and reducing food cravings. It is based on limiting calorie intake combined with an emphasis on positive lifestyle and behavioral adjustments. It will appeal to dieters who prefer to follow a structured plan and easily get bored with exercise.